One of my coworkers has an adorable dachshund mix puppy - and we thought of cute little Eisley right away when we saw this! 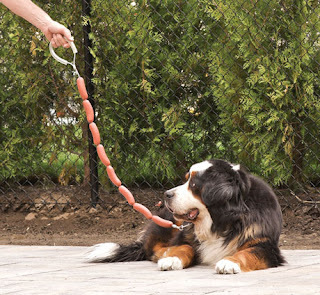 Sold by What On Earth Catalog, this Hot Dog Leash is only $9.95. Love it! Have a fabulous Friday. Oh my goodness... I thought the hot dogs were real for a second lol. ha ha - M says she loves it! this is too adorable and yes you are right...it should be a dachshund modeling it! Maybe it's just me, but I think that leash is...strange! Gotta send this to my cousin...mom to three doxxies. They should make a TUNA leash for us!